Eggs, like some other foods, have gotten a bit of a bad rap over the years, with numerous findings reporting that eggs can be chiefly responsible for high levels of cholesterol. However, the truth of the matter is altogether different. In fact, not only is the cholesterol statement erroneous, eggs actually have many varied — and essential — benefits for your body. Because the average large egg contains between 180 and 186 milligrams of cholesterol, just one immediately counts for over half of your recommended daily intake, the Huffington Post reports. However, it's a little more complicated than that: It turns out cholesterol is actually already being produced, in rather significant amounts, by your body – 1 to 2 grams each day on average. But when you consume foods that contain cholesterol, your body's production of the substance decreases to make up for it. You don't really add cholesterol to existing amounts, you're replacing one kind with another. Authority Nutrition makes another excellent point: While cholesterol has negative connotations for obvious reasons, it is not a purely harmful molecule. Cholesterol is a vital part of the body, and is essential in creating testosterone, estrogen and cortisol. The website also reports a study where a group of individuals took to eating one to three whole eggs a day. For 70 percent of those people, eggs did not negatively affect cholesterol levels. For the remaining 30 percent, the issue was fairly benign as well: Eggs were found to change LDL cholesterol (the harmful variety) from small, dense molecules to larger ones, which made them a lot less of a threat. One damper on the good news, however: Eggs are found to cause an increased risk of heart disease in diabetics, Authority Nutrition says. Eggs are rich in several different types of nutrients, according to the Huffington Post: They're rich in vitamins A, D, E and B-12, as well as iron, folate, calcium, and omega-3 fatty acids, among others, all of which are extremely important. According to Health 24, eggs provide the highest-quality protein, with a much higher rating than milk or beef. You'd need about 30 grams of meat to equate to a single egg, which is much less expensive. Choline, a nutrient you don't frequently hear about, is nonetheless very important for the brain. It helps promote growth and memory function, Health 24 says. Choline supplements are especially crucial for pregnant mothers, where most of the woman's choline supplies will be sent to her child and she will be left with a critically low amount. Authority Nutrition goes so far as to say 90 percent of people are lacking in choline. Eggs contain plenty of this nutrient. 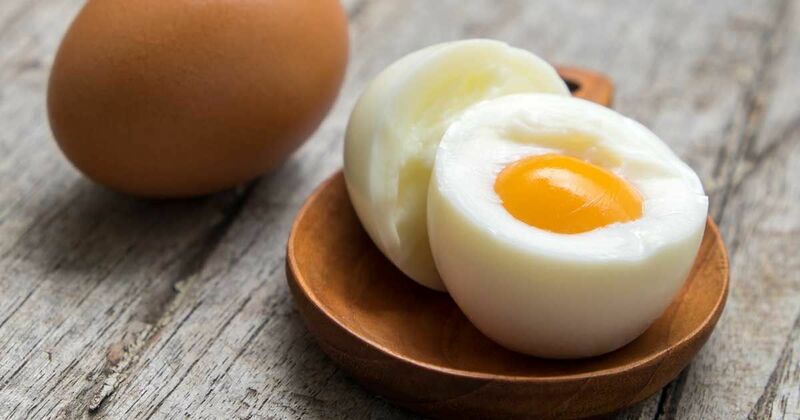 The Huffington Post says eggs are rich in lutein and zeaxanthin, antioxidants that gather in the eye region and protect your eyes from dangerous light wavelengths, as well as lower the risk of macular degeneration and cataracts. Eggs help with satiety, meaning they make you feel fuller than many other foods. Health 24 reports people who start the day with some eggs in their breakfast feel much less hungry throughout the day, which allows them to take smaller meals. The vitamin D and calcium mentioned previously are of great importance for the bones, helping them grow stronger. Eggs help prevent osteoporosis this way, according to Health 24. In addition, the amino acids and minerals in eggs promote healthier hair and nails, the website says. So should you eat three eggs a day? Authority Nutrition recommends it, saying the benefits are much stronger than the downsides. But "Today" reports such an intake in eggs can lead to carotid plaque buildup in the arteries, as well as an increased risk in heart attack and stroke due to the presence of trimethylamine N-oxide, a somewhat harmful chemical. The Huffington Post suggests varying up your diet a bit, stating three eggs a day can be a bit much. However, there's clearly no reason not to enjoy more than one of these a day – especially if you prefer free-range eggs to the supermarket variety, which has been found to provide a lot less nutrients. What do you think of these findings? Let us know in the comments, and share this story with your friends!